Lupinus nootkatensis and Castellja unalaschensis flowering in a subalpine meadow in the Chugach Mountains. 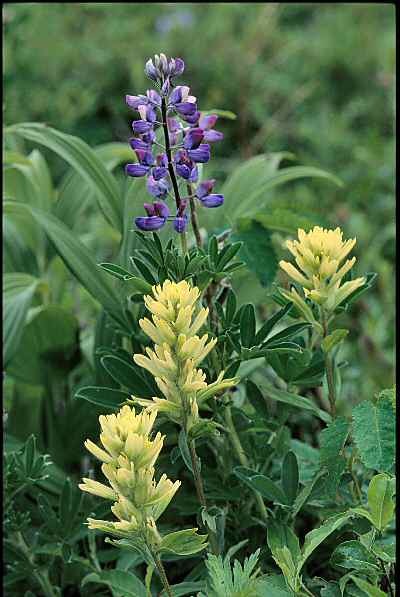 Wildflowers exhibit incredible form and color, as seen in the Arctic Lupine, Lupinus nootkatensis, and Yellow Paintbrush, Castilleja unalaschensis, shown together to the left. They are among the most successful seed producing plants, the angiosperms, also called flowering plants. The angiosperms first appear in the fossil record about 130 million years ago, well before the extinction of the dinosaurs. These plants develop their seeds in a completely enclosed chamber called an ovary. A fully ripened ovary is called a fruit and contains the mature seeds as shown in the fruit of the Lupine in the photo below. 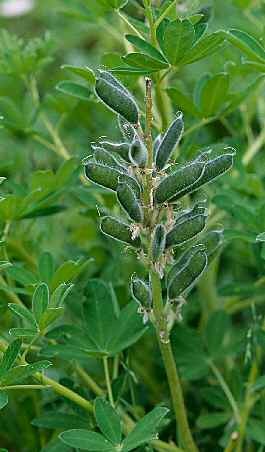 As you can see, the Lupine is a member of the Pea Family, Fabaceae, but don't eat these peas! They're poisonous. I have included photographs of flowering plants, including flowering trees and shrubs in the category "Wildflowers" in the main menu, but the more inclusive category is "Angiosperms" as shown by the specific menu to the left. The meaning of the botanical names included with many of the photos have been mainly taken from The Names of Plants by David Gledhill, a very useful book. I have occasionally consulted Gardener's Latin by Bill Neale. Merriam Webster's Collegiate Dictionary is also a good source for the etymology of plant names .Thanks also to Dr.E.Charles Nelson who corrected by email some plant name derivations in the Ericaceae.